When astronauts aboard the International Space Station shot this photograph on May 22, 2018, B-15Z measured 10 nautical miles long and 5 nautical miles wide. That’s still well within the trackable size. But the iceberg may not be tracked much longer if it splinters into smaller pieces. A large fracture is visible along the center of the berg, and smaller pieces are splintering off from the edges. It has split along the fracture. Next day it is barely visible through the clouds, but it is still high enough to cause ripples in the clouds. The Antarctic Ice Sheet is an important indicator of climate change and driver of sea-level rise. Here we combine satellite observations of its changing volume, flow and gravitational attraction with modelling of its surface mass balance to show that it lost 2,720 ± 1,390 billion tonnes of ice between 1992 and 2017, which corresponds to an increase in mean sea level of 7.6 ± 3.9 millimetres (errors are one standard deviation). Over this period, ocean-driven melting has caused rates of ice loss from West Antarctica to increase from 53 ± 29 billion to 159 ± 26 billion tonnes per year; ice-shelf collapse has increased the rate of ice loss from the Antarctic Peninsula from 7 ± 13 billion to 33 ± 16 billion tonnes per year. We find large variations in and among model estimates of surface mass balance and glacial isostatic adjustment for East Antarctica, with its average rate of mass gain over the period 1992–2017 (5 ± 46 billion tonnes per year) being the least certain. I see this is a report on the (recently posted) original material from Lennart van der Linde, but will put it in anyway. Antarctic ice loss has tripled in a decade. If that continues we are in serious trouble. From Chris Mooney at Washington Post, this is not a primary source. I attach fig 2 and table 1 from the IMBIE paper. Comparing 1992-1997 to 2012-2017 shouw the mass loss rate tripling for WAIS and more than quadrupling for the peninsula. That issue of Nature has many good papers on Antarctica. It will take me a while to go thru them all. As I mentioned, the latest issue of Nature has several papers on Antarctica. I have not fully absorbed any of them yet, since i have been running around the midwest, but here are my gleanings so far. I have already posted a figure and a table previously. Here are some more excerpts, and my comments. 1)They find strong increase in overall mass loss from WAIS and the peninsula. "At the Antarctic Peninsula, the 25-year average rate of ice-sheet mass balance is −20 ± 15 Gt/yr, with an increase of about 15 Gt/yr in losses since 2000. The strongest signal and trend has occurred in West Antarctica, where rates of mass loss increased from 53 ± 29 Gt/yr to 159 ± 26 Gt/yr between the first and final five years of our survey; the largest increase occurred during the late 2000s when ice discharge from the Amundsen Sea sector accelerated  . Both of these regional losses are driven by reductions in the thickness and extent of floating ice shelves, which has triggered the retreat, acceleration and drawdown of marine-terminating glaciers  . The least certain result is in East Antarctica, where the average 25-year mass trend is 5 ± 46 Gt/yr . Overall, the AIS lost 2,720 ± 1,390 Gt of ice between 1992 and 2017, an average rate of 109 ± 56 Gt/yr." 2) Regarding SMB, they find that there is no trend across AIS: "The temporal variability of all products is similar and they all agree on the absence of an ice-sheet-wide trend in SMB over the period 1979–2017, which implies that recent mass loss from the AIS is dominated by increased solid-ice discharge into the ocean. " "The temporal variability of all products is similar and they all agree on the absence of an ice-sheet-wide trend in SMB over the period 1979–2017, which implies that recent mass loss from the AIS is dominated by increased solid-ice discharge into the ocean." "Models predict the greatest rates of solid-Earth uplift (5–7 mm/yr on average) in areas where GIA is a substantial component of the regional mass change, such as the Amundsen, Ross and Filchner–Ronne sectors of West Antarctica (see Extended Data Fig. 4), but also the greatest variability (for example, a standard deviation of more than 10 mm/yr in the Amundsen sector). Away from areas with large GIA signals there is low variance among the models and broad agreement with GPS observations  ." Another paper in this issue of Nature is a review by Shepherd et al. doi: 10.1038/s41586-018-0171-6 of the satellite record across Antarctica. Somewhat surprisingly, they state that the overall rate of ice loss has "changed little" since 1992. I suspect they have a different definition of substantial change than I do. "these studies show that the continent has contributed 7.6 ± 3.9 mm to global sea levels since 1992. Two-fifths (3.0 ± 0.6 mm) of this loss occurred during the past five years 10 . Although the rate of ice loss from the entire Antarctic ice sheet has changed little during the satellite record, speedup of glacier flow in the Amundsen Sea sector has led to accelerated losses from this region [37,38] ." "Although most of Antarctica has remained stable over the past 25 years, there are clear patterns of imbalance in many coastal sectors—such as the thickening of the Kamb Ice Stream and the thinning of glaciers flowing into the Amundsen Sea and at the Antarctic Peninsula. These changes reflect imbalance between ice flow and snow accumulation within the surrounding catchments. The pace of ice flow at the Kamb Ice Stream is unusually low  and has not altered in recent decades, but analysis of ice-penetrating radar measurements  shows that it stagnated over a century ago. Elsewhere, inland glacier thinning is almost exclusively coincident with contemporaneous ice speedup [21,42,43] (indicating that the thinning is dynamic in nature) and with perturbations at the marine termini of the glaciers  (indicating that the thinning has resulted from ocean forcing)." "However, localized and episodic rises and falls of the ice sheet surface were then spotted in satellite interferometric  and altimetric records [47,48] , suggesting otherwise. These fluctuations, amounting to changes in height of 1–10 m over sub-decadal timescales, are interpreted to be the surface expressions of water transferring between active subglacial lake networks. More than a hundred active lakes have now been identified using this approach  ... Thanks to these data, we now know that in addition to periodically flushing subglacial cavities, the presence  of and fluctuations  in subglacial lake water can lubricate ice flow in parts of the continent." "Although the major Ross, Filchner-Ronne, and Amery ice shelves have remained stable since the 1990s,"
"many ice shelves in West Antarctica have experienced long-term thinning over the same period. In the locations where retreat or thinning have occurred, the grounded ice inland has also been destabilized. The dominant control on this pattern is believed to be the presence (or absence) of warm ocean currents offshore  . Altogether, the volume of Antarctic ice shelves has declined through net overall thinning (166 ± 48 km^3/yr between 1994 and 2012; ref. 11 ) and through progressive calving-front retreat of those at the Antarctic Peninsula (210 ± 27 km^3/yr between 1994 and 2008; ref. 3 ). Combined, these losses amount to less than 1% of their volume. However, the highest ice shelf thinning rates have occurred in the Amundsen and Bellingshausen seas  , where five have lost between 10% and 18% of their thickness  owing to ocean-driven melting at their bases  ." " The relationship is, however, not universal; for example, although the Wilkins ice shelf collapsed in 2009, it did not thin in the preceding five years  ." Wilkins was one of Mercer's canaries. "Over the past two decades, for example, surface lowering has spread inland across the drainage basins of the Pine Island and Thwaites glaciers at speeds of between 5 and 15 km/yr, and the majority of their catchments are now in a state of dynamical imbalance (they are thinning owing to accelerated flow)." "Glaciers flowing into the Amundsen Sea sector of West Antarctica are particularly susceptible to climate forcing, owing to their geometrical configuration and the absence of any substantial ice shelf barrier  , and today the pace of ice sheet retreat along parts of this coastline dwarfs that during the Holocene period. The region’s ice shelves have thinned [11,12] by 3 to 6 m/yr, and its glacier grounding lines have retreated [85,86] by 10 to 35 km since 1992, which is 20 to 30 times the rate since the Last Glacial Maximum ..."
"The forcing for these events is now widely regarded to lie in the surrounding ocean, because ice drawdown has originated at and evolved from the terminus of neighbouring but distinct ice flow units , and because warm  and warming  water is present within the cavities beneath their peripheral ice shelves." "it has been concluded  that the region is now undergoing marine ice sheet instability, with no geometrical obstacles to prevent irreversible decline." "However, satellite observations have revealed that retreat of the Pine Island Glacier halted around 2011 [95,96],and that ice thinning inland abated in the following years . This suggests that the situation is more complicated than a consideration of the glacier geometry alone, and may involve changes in the degree of ocean forcing, as has occurred in the recent past [87,97] ." Thy have an extended discussion of sea ice which i will not cover here. "Although persistent ice shelves have fringed Antarctica for thousands of years 56 , there is now widespread evidence of changes in their extent ] and thickness [3,11] . Altogether, their volume has decreased by more than 300 km^3/yr since 1994 [3,11] , notably due to collapse and calving at the Antarctic Peninsula and rapid thinning of those in the Amundsen and Bellingshausen seas. These events have triggered retreat [85,86] and acceleration [21,43] of marine-terminating glaciers and ice streams around the continent, leading to the drawdown of ice from their inland catchments [39,42] . Since 1992, the grounded ice sheet has lost 1,350 ± 1,010 Gt of ice, causing a net 3.8 ± 2.8 mm contribution to global sea level rise  ." "A key unanswered science question is how long it will take for the ice shelves that are currently thinning to reach a point whereby they are no longer providing effective buttressing for the grounded ice inland." Indeed. Inquiring minds want to know, and every coastal community in the world needs to know. I attach figs 1 and 2. They are very pretty. "These findings indicate that atmospheric warming during the past eight million years was insufficient to cause widespread or long-lasting meltback of the EAIS margin onto land.We suggest that variations in Antarctic ice volume in response to the range of global temperatures experienced over this period—up to 2–3 degrees Celsius above preindustrial temperatures  , corresponding to future scenarios involving carbon dioxide concentrations of between 400 and 500 parts per million—were instead driven mostly by the retreat of marine ice margins, in agreement with the latest models [5,6] ." "The near absence of cosmogenic nuclides in our record therefore rules out substantial and long-lasting EAIS retreat onto land during the past 8 Myr ..."
"these models suggest that warming consistent with even the most intense interglacials of the past 8 Myr would have produced minimal land exposure around the entire EAIS margin [6,8] ." "our findings agree with model simulations which show that the terrestrial EAIS experiences minimal melt when carbon dioxide levels are at their present value of roughly 400 parts per million for extended periods of time, whereas some marine-based ice-sheet sectors largely disappear [5,23]"
ANDRILL is a gift that keeps on giving. There are, of course, large basins of EAIS (Totten comes to mind) where ice is grounded well below present day sea level. More drilling clearly needed. I note there are some heavy hitters on that author list. Naish must have done a lot of the modelling. "Rebound-driven stabilizing processes were apparently able to halt and reverse climate-initiated ice loss. Whether these processes can reverse present-day ice loss  on millennial timescales will depend on bedrock topography and mantle viscosity—parameters that are difficult to measure and to incorporate into ice-sheet models." So WAIS retreated, but then isostatic rebound elevated the previously ice covered regions sufficiently to allow the sheet to re-advance. Note that this uplift occurs over millennial timescales, so may not be important for, say, the next thousand years. Their reconstruction (using PISM) shows that Ross and Ronne almost completely disappeared around 10KYr ago, and then the grounding lines re-advanced to present day. "In this simulation, rising sea-level and surface temperatures during the last glacial termination drive grounding-line retreat through regions currently occupied by the Ronne and Ross ice shelves. The grounding line reaches its most retreated position around 10 thousand years (kyr) before present (bp), up to approximately 300 km inland of the present-day grounding line (Fig. 3 and Extended Data Fig. 3). Retreat exposes nearly all of our core sites and the bed of HIR to the ocean. Approximately 352,000 km 2 of the area that is covered by grounded ice today ungrounds during retreat, resulting in lithospheric rebound of up to 175 mm per year. The rising bed eventually causes the Ross and Ronne ice shelves to ground on bathymetric highs in the locations of present-day ice rises, including HIR. Ice-rise formation increases ice-shelf buttressing, causing the grounding line to re-advance towards its present-day location (Fig. 3 and Extended Data Fig. 4; Methods) "
But not so for Amundsen: "In the Amundsen Sea sector, the grounding line retreats to its modern position without substantial inland retreat and re-advance. " "Furthermore, we hypothesize that the grounding line in the Weddell and Ross Sea sectors may be capable of retreating far inland of its present position without triggering runaway ice-sheet collapse." "We note that our model does not simulate retreat and rebound driven re-advance in the Amundsen Sea sector (Fig. 3), where present-day retreat of the grounding line is causing concern about future runaway collapse 6 and recent re-advance could explain observed sub-shelf iceberg ploughmarks  . Our findings motivate future work to examine whether rebound-driven mechanisms could slow or reverse this retreat on millennial timescales." I attach figure 3. They have a movie also, but i had difficulty with it, seemed to have random black patches. Rintoul has a perspective and a review in this issue of Nature. The Perspective lays out an optimistic and a pessimistic scenario for AIS upto 2070. These depend on human behaviour over the next fifty years, so should be taken as an informed guess. "Under the high-emissions scenario, Antarctica and the Southern Ocean undergo widespread and rapid change, with global consequences. But the environmental change realized by 2070 will be only a fraction of the change to which we are committed by choices made today, and the rate of change will have increased and continue to accelerate. For example, once initiated, the marine ice sheet instability will result in irreversible loss of large parts of the ice sheet resting on bedrock below sea level. Under the low-emissions scenario, in which global average temperatures remain within 2 °C of 1850 values, there is some chance that the buttressing ice shelves will survive and the Antarctic contribution to sea level rise will remain below 1 m. Under the high-emissions scenario, the ice shelves are lost and Antarctica contributes 0.6 m to 3 m of sea level rise by 2300, with an irreversible commitment  of 5 m to 9 m, or as much as  15 m in the coming millennia." But even in the optimistic scenario, the qualifier "there is some chance" seems to show his doubts. "The theoretical foundation for Southern Ocean dynamics is developing rapidly, but remains incomplete. This gap is reflected, for example, by the speculative nature of the above discussion of the response of the Southern Ocean to changes in forcing and by our inability to do much more than list the mechanisms that influence the delivery of ocean heat to the Antarctic margin. The fact that new observations continue to reveal surprises that challenge existing thinking also underscores gaps in knowledge; examples include the unanticipated variability of the Southern Ocean carbon sink, the dominant contribution of the Southern Hemisphere to the change in global ocean heat content in the past decade, and evidence that the East Antarctic Ice Sheet is more exposed to ocean heat transport than once thought." Don't get me wrong. This review is required reading for an understanding of Southern ocean dynamics. Bamber et al. doi: 10.1088/1748-9326/aac2f0 look at land ice contribution to sea level rise in the satellite era. Their result is smaller than many GRACE derivations, which they claim is due to smaller trends for glaciers and ice caps. "Pine Island Glacier is one of the most vulnerable regions of the Antarctic to ice shelf collapse and has seen marked thinning rates and grounding line retreat over the last decade (4, 6). Pine Island Glacier Ice Shelf has had five large calving events between 2000 and 2017. The fracture that grew to cause the most recent calving event in September 2017 initiated over one of the ice shelf basal channels. The channels have been identified from MODIS imagery (5) and radar surveys (6). 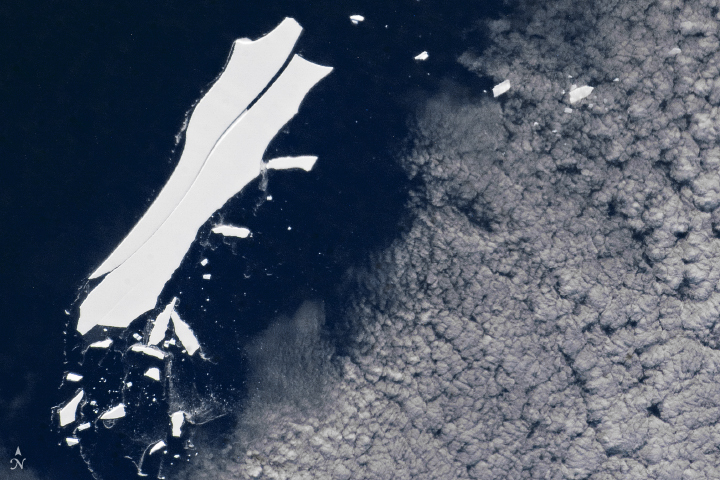 A 4-km-wide polynya identified from Landsat imagery in 2000 also supports the presence of a channel in this location. The fracture (Fig. 1G) can first be seen in March 2015 with a length of 3.7 km. By February, the fracture had moved 3.4 km downstream and lengthened to 7 km. In January 2017, the fracture was 5.4 km downstream and 19 km long. 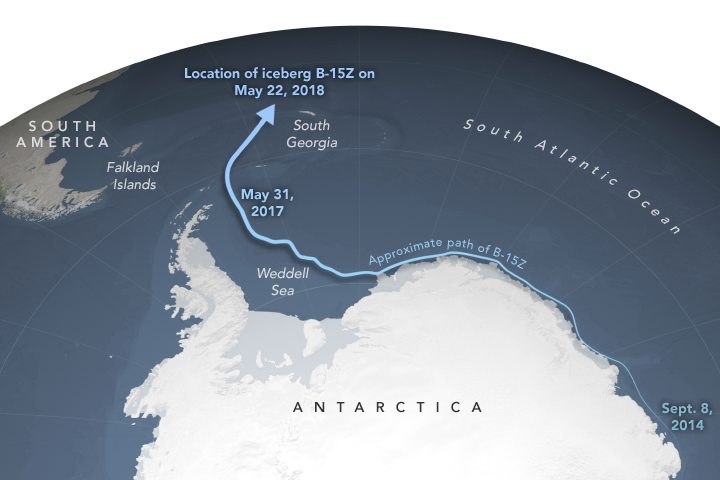 This fracture culminated in a calving event in September 2017 creating the 185-km 2 B-44 iceberg. The formation of a fracture originating from the center of the ice shelf and propagating laterally, rather than from the edge toward the center has previously been attributed to crevasses originating from the grounding line (27). Here, we suggest that thinning within the basal channel is a driver for the initial transverse location of the fracture, and the role of grounding line originated crevasses is to determine the longitudinal location of fracture formation." I attach the picture for PIG, but they have many others including Totten and Petermann. I seem to have omitted the Massom paper doi:10.1038/s41586-018-0212-1 on the protective effect of sea ice on ice shelves through attenuation of ocean swell. They intensively examine the Larsen and Wilkins collapses. open-water duration of approximately three months occurred between 1979/1980 and 2009/2010 ." "The sea ice loss in each case resulted in extensive and sustained periods of exposure to broadly open-ocean conditions offshore "
"Occurring immediately before each disintegration event, sliver-berg calvings (Fig. 2) removed keystone blocks from the arch-like configuration of the ice shelf front that were crucial to its structural integrity." i attach figure 3, showing decline in sea ice in the region. Thank you Sidd for all these summaries. I'm afraid they dont deserve to be called summaries. Consider them no more than my immediate reactions. It will take me weeks to read through them with the care they warrant. I suggest reading at least the abstracts for a precis of the most important results. I know I skipped a lot. The GRACE-FO microwave ranging instruments allow distance measurements with a precision better than one micron -- less than the diameter of a blood cell, or a tenth the width of a human hair....... To demonstrate the initial performance of GRACE-FO's microwave ranging system, the team examined its measurements of changes in the distance between the two satellites as they flew over the Himalayas...... The plot's wavy lines show how the distance between the satellites varies as the satellites pass over oceans, land areas, and particularly mountains as they orbit Earth. The observed inter-satellite distance changes, which can be as large as hundreds of microns, are in good agreement with expectations. These results give the team confidence that the mission's key microwave ranging system is performing well. By measuring even minute changes in distance between the satellites, GRACE-FO can detect the month-to-month variations in Earth's gravity field caused by the movement of mass as small as about a half-inch (1 centimeter) of water over an area of about 200 miles (320 kilometers) in diameter. Also saw Susan's post but none of yours, despite visiting the forum every single day. In the past one always had the mail notifications, now one must login every single time or you loose the notifications. I don't like that, since there are some threads that I rarely comment in but do try to follow, like this one. Why did Neven change this setting? There is a link called "Show unread posts since last visit." that shows all the threads with unseen posts. Thanks, I've already worn out my scroll-wheel once. Sidd, that is some outstanding review, I'm looking forward to taking a closer look when there is time. Please don't forget that I am an amateur amateur, and normally if I have something to say about ice, it is because of somebody else's work. variable climate in the mid-20th century"
In light of this result, I suspect Kinslake et al. (on which i commented earlier) may visit to recalculate their results in the Amundsen secto, since the crust beneath is more labile than they assumed. This may help make their results in that area better. To demonstrate the initial performance of GRACE-FO's microwave ranging system, the team examined its measurements of changes in the distance between the two satellites as they flew over the Himalayas...... GRACE-FO can detect the month-to-month variations in Earth's gravity field caused by the movement of mass as small as about a half-inch (1 centimeter) of water over an area of about 200 miles (320 kilometers) in diameter. The LRI, which is being flown as a technology demonstration, has made its first measurements in parallel with GRACE-FO's main microwave ranging instrument, and initial comparisons of the data from the two types of instruments show that they agree as expected. Further Grace-FO alignments appear to continue the good news for Grace-FO. Thanx for the pointers. Nice articles. Antarctica is surrounded by the circumpolar current, an endless loop of water pushing ever-eastward, driven by the powerful southern winds and unobstructed by land, other than being forced through the narrow gap between the Antarctic Peninsula and Tierra del Fuego. Although whales and seabirds can power across this obstacle, few other life forms can do so, keeping the frozen continent almost biologically isolated from the rest of the planet. At least that is what was believed, until the Universidad de Concepción's Dr Erasmo Macaya, unable to do the work he had come to King George Island to do, spent a lot of time walking along the beaches looking at seaweed. Macaya noticed that some of the kelp didn't look like it should be there. The oceans off Antarctica, cold as they are, do support some kelp species, but Macaya's finds were Durvillaea antarctica, which somewhat ironically does not normally live close to the continent with which it shares its name. I've already worn out my scroll-wheel once. "Mass loss from the Amundsen Sea sector of the West Antarctic Ice Sheet has increased in recent decades, suggestive of sustained ocean forcing or an ongoing, possibly unstable, response to a past climate anomaly. Lengthening satellite records appear to be incompatible with either process, however, revealing both periodic hiatuses in acceleration and intermittent episodes of thinning. Here we use ocean temperature, salinity, dissolved-oxygen and current measurements taken from 2000 to 2016 near the Dotson Ice Shelf to determine temporal changes in net basal melting. A decadal cycle dominates the ocean record, with melt changing by a factor of about four between cool and warm extremes via a nonlinear relationship with ocean temperature. A warm phase that peaked around 2009 coincided with ice-shelf thinning and retreat of the grounding line, which re-advanced during a post-2011 cool phase. These observations demonstrate how discontinuous ice retreat is linked with ocean variability, and that the strength and timing of decadal extremes is more influential than changes in the longer-term mean state. The nonlinear response of melting to temperature change heightens the sensitivity of Amundsen Sea ice shelves to such variability, possibly explaining the vulnerability of the ice sheet in that sector, where subsurface ocean temperatures are relatively high." It got down to -82.4 C at Vostok yesterday. (Record low there is -89.2 on 21/7/1983). 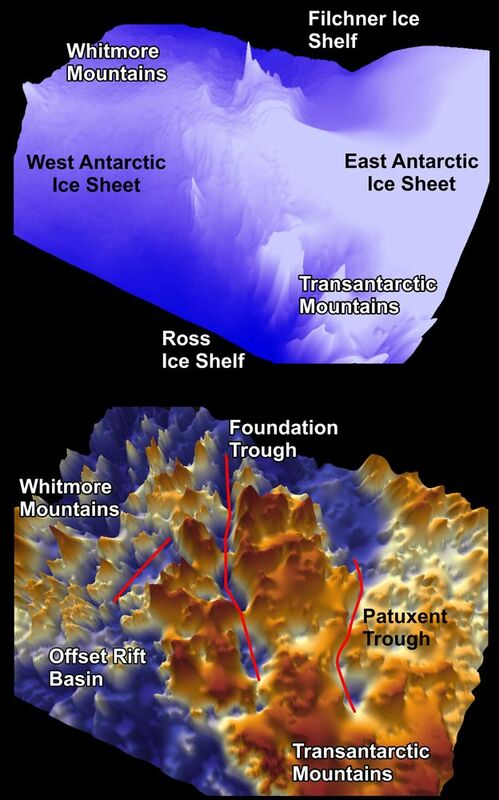 Is there a link to a Wipneus Antarctic only graph? Like this link is for global https://sites.google.com/site/arctischepinguin/home/sea-ice-extent-area/grf/nsidc_global_area_byyear_b.png. Checking https://sites.google.com/site/arctischepinguin/home/sea-ice-extent-area/grf I can see a link to such a graph https://sites.google.com/site/arctischepinguin/home/sea-ice-extent-area/grf/nsidc_antarctic_area_byyear.png?attredirects=0, however the graph is not up to date. PM Wipneus and he will probably be able to fix it easily or provide you with an alternate link. Building walls on the seafloor may become the next frontier of climate science, as engineers seek novel ways to hold back the sea level rises predicted to result from global warming. By erecting barriers of rock and sand, researchers believe they could halt the slide of undersea glaciers as they disintegrate into the deep. It would be a drastic endeavour but could buy some time if climate change takes hold, according to a new paper published on Thursday in the Cryosphere journal, from the European Geosciences Union. Though the notion may sound far-fetched, the design would be relatively straightforward. “We are imagining very simple structures, simply piles of gravel or sand on the ocean floor,” said Michael Wolovick, a researcher at the department of geosciences at Princeton University in the US who described the plans as “within the order of magnitude of plausible human achievements”. The structures would not just be aimed at holding back the melting glaciers, but at preventing warmer water from reaching the bases of the glaciers under the sea. New research is now being undertaken by scientists showing how the effects of the warmer water around the world, as the oceans warm, may be the leading cause of underwater melting of the glaciers. The novel describes escalating phases of what appears to be an invasion of Earth by aliens. The aliens are speculated to come from a gas giant, and thus can only survive under conditions of extreme pressures in which humans would be instantly crushed. The deepest parts of the oceans are the only parts of Earth in any way useful to them. Humanity nevertheless feels threatened by this new phenomenon – particularly since the newcomers show signs of intensive work to adapt the ocean deeps to their needs. In the final phase,the aliens begin melting the polar ice caps, causing sea levels to rise. London and other ports are flooded, causing widespread social and political collapse. Eventually organised social and political life in general ceases to exist. Ultimately, scientists in Japan develop an underwater ultrasonic weapon that kills the aliens. However, the global population has been reduced to between a fifth and an eighth of its pre-invasion level, and the world's climate has been changed permanently. The book describes in some detail the ever greater efforts by society to prevent catastrophe rather than adapt to it. Higher and higher sea walls and other massive infrastructure - all doomed to fail. To me it was a good illustration of the mind-set that says "we can fix it, no matter what it is". Man as the master of nature. I doubt if I will be around long enough to see sea walls in the Antarctic happen, though I am sure to see a lot of the built environment in Florida being put on stilts and an awful lot of new sea walls, raised roads etc. built on land. It is really so stupid. I am sure these scientists are well-meaning, and experts in their field, but what is more cost-effective: build hundreds or thousands of kilometers of underwater seawalls in the most inhospitable environment on Earth as a stopgap solution to a part of the problem, or deploy enough solar panels and wind turbines to stop climate change? I am sure the latter gives more bang for the buck, should some government or a global entity decide to actually do something. I agree, but it's much better than seeding the atmosphere or oceans with chemicals. But only, as you say, if it turns out that things can't be stopped with renewable energy any longer, and time needs to be bought. now you know why i wrote sarc first, that saved many a few extra heart beats. willl find better words like so often. Very anthropogenic, that study was up here in mid March. "the grounding-line position persisted for a minimum of 200 years and a maximum of 1400 years after ice shelf breakup." The delay was due to the formation of a grounding zone wedge (GZW) of sediment. WDB refers to the study area, the Whales Deep Basin. "In the case of the WDB, a centuries-long lag necessitates sediment aggradation from a high sediment flux. Sediment flux to the grounding line depends on several factors including the ice-sheet drainage area [Ref. 42] as well as the substrate erodibility and the presence/absence of melt water [Refs. 43,44] . In the case of the WDB, easily erodible unconsolidated Plio-Pleistocene strata underlie the WDB 45 and hence the paleo-BIS sediment flux was sufficiently high to deposit an unusually large-volume compound GZW [Ref. 41] that helped maintain a relatively stationary grounding line." "As concerns the potential for future ice-shelf collapse in the present-day interglacial, it is worth noting that many ice-stream systems are now grounded on the foredeepened inner continental shelves that is presumably underlain by either basement rock or other less erodible substrate. Hence, a transition to unbuttressed flow of those modern ice streams might be less able to maintain a grounding position by accelerated deposition of sediment within the grounding zone." Anecdotal evidence of increased storminess in the Southern Ocean from amateur sailors who suffer very real consequences. The linked article is concerned with the very real effects on sailors racing or cruising this ocean. "Average surface wind speeds and wave heights in the Southern Ocean have steadily increased since the 1960s and particularly so in the last 20 years. Significantly, the biggest spikes are seen in extreme peak conditions, and the “hottest” spot in the course is the stretch between Cape Town and Australia." This paper came out in July, but i seem to have missed it. Mohajerani et al. (the other authors are heavyweights, Velicogna and Rignot) tighten limits on Totten ice loss using GRACE data. Upshot it 18.5 +/- 6.6 Gtonne/yr from 2002-2016. Moss Beds in East Antarctica not doing well. I did not know that they existed. Emerging from the ice for a brief growing season every Antarctic summer, the lush green mosses of East Antarctica are finally succumbing to climate change. That is according to a study of the small, ancient and hardy plants - carried out over more than a decade. This revealed that vegetation in East Antarctica is changing rapidly in response to a drying climate. "Visiting Antarctica, you expect to see icy, white landscapes," said lead scientist Prof Sharon Robinson from the University of Wollongong, in Australia. "But in some areas there are lush, green moss beds that emerge from under the snow for a growing period of maybe six weeks." While West Antarctica and the Antarctic Peninsula are some of the fastest warming places of the planet, East Antarctica has not yet experienced much climate warming, so the scientists did not expect to see much change in the vegetation there. "But we were really surprised when we saw how fast it was changing," Prof Robinson said. "After a pilot study in 2000, we set up monitoring in 2003. When we returned in 2008, all these green moss beds had turned dark red, indicating they were severely stressed. It was a dramatic change. "They change from green to red to grey if they get really stressed. "The red pigments are the sunscreen and drought stress protective pigments they produce to protect themselves - antioxidant and UV screening compounds. "Grey means they are dying." Led by Andrew Fountain, a geology professor in PSU's College of Liberal Arts and Sciences, a team of researchers used an airborne laser scanner, or lidar, to measure the surface elevations of glaciers, soils and ice-covered lakes in Antarctica's largest exposed land region. The team then compared the elevations to similar measurements made in 2001 by a different project. The work was support by the National Science Foundation, which manages the U.S. Antarctic Program, the nation's research endeavor on the southernmost continent. The findings were reported Sept. 13 in the journal Geomorphology. "Millions of cubic meters of buried ice have melted in the last decade," said Joseph Levy, the paper's lead author and an assistant professor of geology at Colgate University. "It's unprecedented change over the historic period of Antarctica and perhaps since the end of the last ice age. If it keeps up, it could remove the last ice deposits from some valleys in about five hundred years." Levy said they believe the culprit is meltwater. When soils thaw and become wet from melting the buried ice below, their insulating capacity is reduced and they conduct much more heat. "The valleys have been considered almost timeless, yet here we see some changes that would be considered rapid even in more temperate climates," Fountain said. These rapid changes over the past 14 years come at a time when the Antarctic climate may be turning a corner. While the Dry Valleys region was cooling locally during the 1990s and early 2000s, warmer summers followed. A major melt episode in the Antarctic summer of 2001-2002 set the stage for widespread melting in this polar desert landscape. What's new in Antarctica ? Greed and stupidity displayed for all to see. The planet (that includes us) loses big-time again. A plan to turn a huge tract of pristine Antarctic ocean into the world’s biggest sanctuary has been rejected, throwing the future of one of the Earth’s most important ecosystems into doubt. Environmental groups said Russia, China and Norway had played a part in blocking the proposal, with the other 22 members of the Commission for the Conservation of Antarctic Marine Living Resources, the organisation set up to protect Antarctic waters, backing the proposal. The 1.8m sq km reserve – five times the size of Germany – would have banned all fishing in a vast area of the Weddell Sea and parts of the Antarctic peninsula, safeguarding species including penguins, killer whales, leopard seals and blue whales. Through its oil and gas exports, Norway is exporting 10 times more emissions than the country produces at home. Norway is the world’s seventh largest exporter of emissions. Norway’s proposed and prospective new oil and gas fields would lead to 150% more emissions than what is in currently operating fields. Norway’s emissions trajectory with proposed and prospective new oil and gas fields is not in line with the rate of global emissions reduction needed to achieve the Paris goals. Norway, world leader in using EV's and domestic hydro. Great little country, inside the borders. Yes. They need a carbon tax, but then the oil wouldn't be competitive. Putting EVs on the road is no substitute for not taking carbon out of the ground. Well said Sleepy. The hypocrisy stinks to high heaven.